Oh, you mean this is where you were taking me…. Although he’s probably dead, at least he had a revelation about his true character before he died. Not many can claim to go to the hereafter with such self-knowledge, so kudos for showing a scene where a doomed minor character is allowed insight into their own soul before they die! Maybe, but business first. You know these guys could have someone killed for a lot less trouble than they’re going to here. Plus the big boss seems like they kind of god who’d prefer not to mess up his or her office. There’s gonna be a talk that probably includes quite a bit about young mr. Andrews. So, he should be sure not to stand on any plastic sheets? I’d want to say hello graphs, but honestly can’t see any evidence of such. Is that statue holding a whisk?
? It’s an arrow. To complement the bow in her other hand. Annoia, Goddess of things stuck in drawers. Always makes me happy, then a little sad. Small God’s was the first Pratchett book I read and I’ve not been disappointed in a read of any of them since. Right next to the God of High Fives. Oh hello, me after 35, fancy seeing you here. I imagine Menace, except like humaner and possibly cracking a joke ? Light goes on, everyone jumps out and yells “SURPRISE”, all his friends and family are there, it was the most elaborate surprise birthday party ever. The cake was amazing. Given how old he apparently is, if ALL his friends and family are there, that would be a big surprise indeed. Of course she’s not allowed in. Jeez, the Illuminati’s such a boys’ club. I strongly doubt that any writer heavily referencing the Greek gods would go that way. 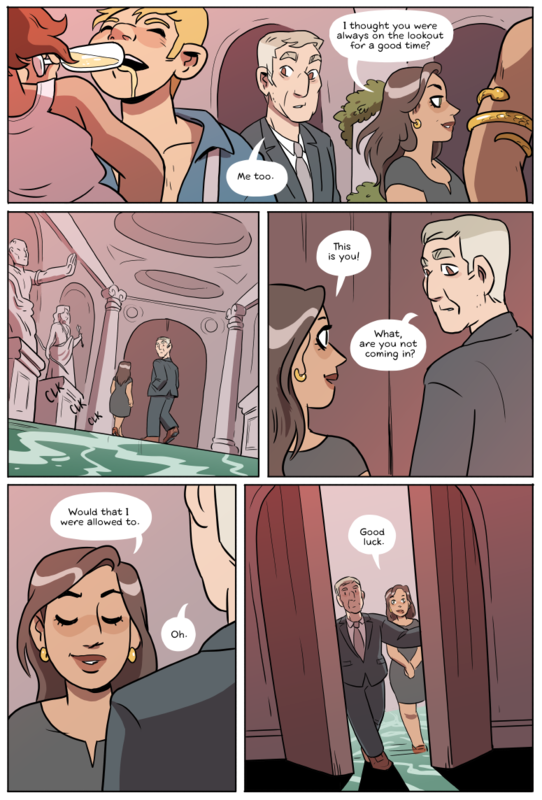 Is that a gender-swapped Alison in the first panel? Those doors must weigh a solid ton. Is ‘would that I were allowed to’ a proper english sentence? Just asking because I’m not a native speaker and it seems a bit off. The construction is a weird one, and I think properly speaking it is an introductory fragment. A more simple construction would be “if only X”, i.e. if only I were allowed to”. But you are right to think that a complete sentence should read, “Would that I were allowed to, I would go”. Also, “If only X” hints at some actual sort of desire on part of the speaker for X to be true. “Would [it] that X” (where “it” is impersonal, as in “it’s raining”) removes even that meaning, omitting even the subject who is doing the wishing, and in this context is actually quite ominous. It is, but it’s a fairly archaic phrasing.